Step Pyramid - The study of the history of Egyptian pyramids is a large and interesting field all by itself. 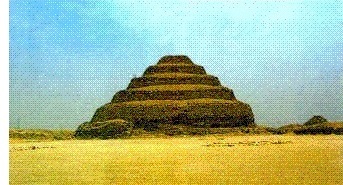 For the sake of this history chart, we will simply say that the Step Pyramid of Djoser is the one that started it all. Before the pyramids, the Egyptians built mastabas to house their dead pharaohs. Then around 2650 BC (at the beginning of the Old Kingdom), someone got the inspired idea to stack mastabas on top of one another, with each successive mastaba slightly smaller than the one below; thus forming the step pyramid. The pyramid of Saqqara consists of six mastabas in total.